Students do Circle Time, Story Time, Art Time, and Portfolio Activities. 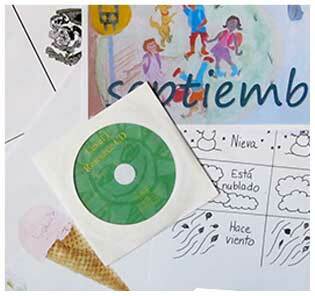 Language concepts are introduced in Circle Time—all in Spanish—through songs, games, and lesson activities. In Story Time the teacher reads an authentic children’s Spanish storybook—engaging students’ imagination and reinforcing language concepts. In Art Time students complete an art project which gives them a hands-on, practical application of language concepts. During Art Time the teacher engages students one-on-one and converses with them in Spanish about what they’re working on—further reinforcing language concepts. Students then practice language concepts and independent reading and writing with the portfolio activities. A comprehensive introduction provides an in-depth look at the methodology and implementation of the curriculum and a step-by-step guide for using the lesson plans. 35 Lessons provide enough material for up to 105 class sessions. Lesson plans include lesson overview pages, lesson procedure pages, and art project procedure pages. 60 Art Projects engage young student in hands-on activities while reinforcing the language concepts for each lesson. Lyrics and TPR directions for all the songs on the music CDs are included. Reproducibles for all the activities and art projects in the lessons save you time planning. The scope and sequence articulates the Communication Objective, Language Outcomes, and vocabulary covered in each lesson. 35 Portfolio activities reinforce the language concepts for each lesson through independent student practice. Students begin to learn to read and write Spanish independently. 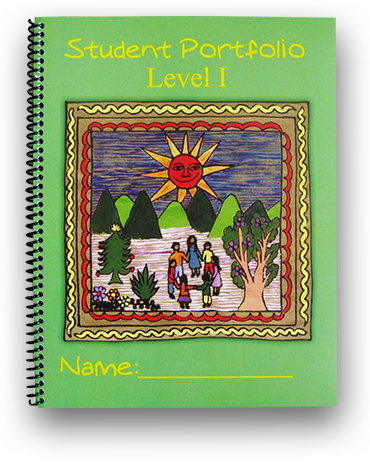 Portfolio activities can be done in class or assigned for homework. Home Reports for each lesson allow parents to see what their child is learning in Spanish. Teachers photocopy and send the reports home to parents. Home Reports also include suggestions for at-home enrichment of lesson themes. Formative and summative assessments allow teachers to monitor student learning in order to guide instruction and evaluate student learning using specific metrics. The Student Portfolio is fully reproducible and comes in both a hard copy, spiral-bound version and a digital version, making it user-friendly for teachers. If you would like to purchase individual copies of the Student Portfolio, click here to see bulk pricing. 105 visual aids and reproducibles for the lesson activities and art projects insure that teachers save time preparing and planning. Gives teachers the capability to build an interactive environment with students who are using laptops or personal devices. The Resource CD also contains a digital version of the Student Portfolio for easy printing. 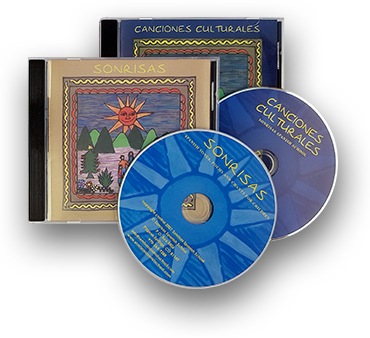 47 fun, easy-to-learn Spanish songs are used to introduce and develop the language concepts for each lesson. 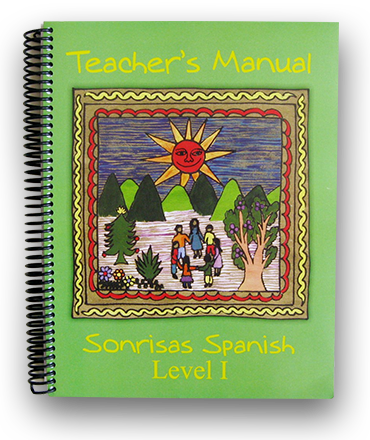 Children acquire Spanish in a fun, age-appropriate, and natural way as they sing songs with their teacher. Both CDs come complete with the lyrics for every song. Detailed explanation of how to establish your Calendar Time routine with over 70 activities. 22 daily, month, and season activities. 30 detailed alphabet activities that teach students the sounds and spelling of the Spanish alphabet. 21 in-depth geography activities which are focused on the Spanish-speaking countries of the world. 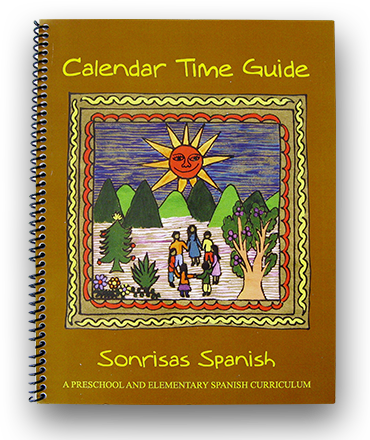 Calendar Time lesson plan, Calendar Time scope and sequence, and Calendar Time scope and sequence template for easy planning. Calendar Time checklist to keep track of all of the activities that you cover. Sixty nine 8.5” x 11” posters that you will use in your Calendar Time lessons. 30 alphabet posters with creative and playful text. The posters correspond to the alphabet activities in the guide. One poster for each month of the year. Five weather posters with common weather phrases. El tren de los días de la semana posters—one poster for each day of the week. Four 18” x 24” laminated posters including a blank calendar, the numbers 1—31, a world map, and daily questions with spaces to write the answers. Colorful, engaging, and useful for each Calendar Time lesson. 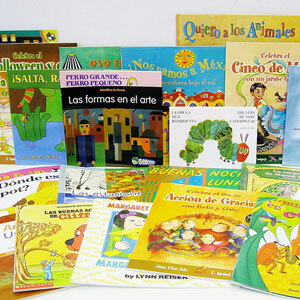 Students can participate in reading and writing Spanish. Use their devices to supplement the Sonrisas Spanish lessons. Listen to and view authentic music videos. Work at their own pace and practice discrete skills with engaging online content. After you purchase, you will receive a unique code to activate your Rockalingua subscription as well as a guide for which videos correspond to the Sonrisas Spanish lessons. Read more about the role of technology in the Sonrisas Spanish Curriculum. What about the Level I Storybook Set? 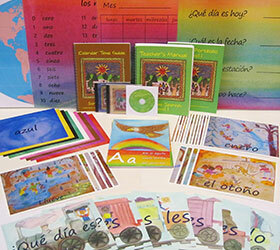 The Level I Storybook Set includes an authentic children’s Spanish storybook for each lesson in Level I. The Level I Storybook Set is not included in the Level I curriculum. You must purchase it separately. You do not have to purchase the Level I Storybook Set with Level I, but then you will want to find the storybooks for each lesson on your own. The storybooks are an integral part of each lesson.